If the cat is friendly, take him to a veterinarian to scan for a microchip and try to find the owner in case he’s a lost pet. (Visit our Lost/Found section for more tips.) If no owner is found, try to place the cat in a home by using social media and reaching out to friends, family and co-workers. You can also try to place the cat with a rescue group, although most groups work from a waiting list. Feral cats are generally euthanized when taken to a shelter because they are not considered adoptable. Many animal shelters lack volunteers and resources to bottle-feed and socialize kittens, making them at high risk for euthanasia, too. If you cannot find a home or a rescue group for the friendly cat and must leave him outside, or if the cat is feral, the most effective and humane approach is Trap-Neuter-Return (TNR). 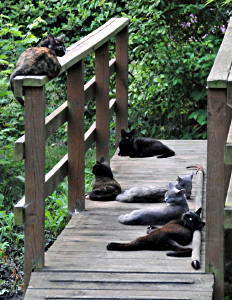 One caretaker trapped and fixed 10 cats (six pictured here) and immediately stabilized his neighborhood cat population. The safest place for pet cats is indoors, but the only environment suitable for feral cats is outside. Trap-Neuter-Return humanely reduces the number of outdoor community cats by preventing new litters. Cats are trapped, spayed/neutered, ear-tipped and returned to the area where they were found. Cats are territorial animals and form strong bonds with the location they call home. Humane Ohio does NOT recommend relocation; it should only be done under extreme circumstances when the cats’ lives are in danger. Moving a colony of feral cats – and convincing them to stay – is a complex process. Ear-tipping is a visual way to identify outdoor community cats that have been spayed or neutered. It’s a standard practice used nationwide. Removing or killing cats doesn’t work. When you remove cats from their outdoor homes, new cats on the outskirts will move in because whatever drew the cats there originally has not changed (garbage cans, dumpsters, shelter). We’ve received calls from communities asking us for help after they removed cats and saw the numbers return after a year. Humane Ohio takes the lead locally helping people care for outdoor community cats. We provide low-cost spay/neuter; lend traps; sell cat shelters, have useful Fact Sheets on our website and offer humane solutions to people who don’t like cats. Our Cattitude Team of volunteers is doing Trap-Neuter-Return (TNR) and we’re working with communities to prevent litters. Have outdoor community cats fixed at Humane Ohio. Our staff can walk you through the TNR process. Borrow an easy-to-use humane trap from us. Bring the cats in for spay/neuter: Guidelines for Outdoor Community Cats (Stray, Feral/Wild, Barn). Monitor the colony. Bring new cats into Humane Ohio to be fixed. Join the Cattitude Team! We have a Facebook group so you can network with others who are caring for outdoor community cats. Offer a home to a “working cat”. If you have a barn, horse stable or greenhouse and are willing to accept feral cats who are spayed/neutered and vaccinated, email cats@humaneohio.org and we can connect you to local groups who have outdoor cats in need of placement. Hold a fundraiser or make a donation to the Dr. Kelly Memorial Fund to help spay/neuter outdoor community cats. Humane Ohio community cat life saving is supported by the Petco Foundation.